Use this Black Friday Price tracker to get the eCommerce advantage in 2017! Now offering Shopify Coupons 2017 for automated competitor price tracking! Black Friday is a day when many retailers finally begin to turn a profit for the year. Some report their highest profits of the year on Black Friday. How can you compete in the craze of Black Friday Sales? Information is everything. In today's highly competitive retail space it is essential to track and monitor your competitors’ prices, deals, strategies in real-time so you can decide on your pricing strategies and market position. Defining the number of competitors important to your business is valuable. You should care only about price-sensitive products, product groups, and categories, which your customers could prefer at a competitor’s store. PriceMole an automated competitor price tracking software monitors, compares and analyzes the price of similar products available at your competitors’ stores. According to our users optimal competitor price monitoring you should focus on two or three competitors according to the listed parameters. Black Friday offers a great opportunity to discover influential retailers in your industry, and how you can use their insights to your advantage. Visualization is important. 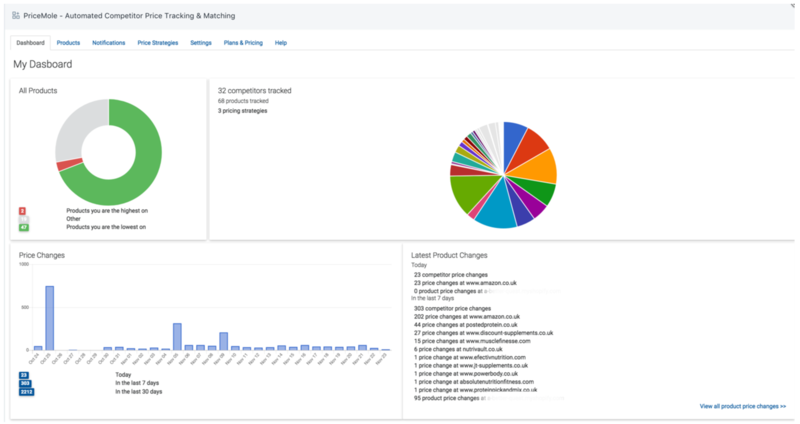 PriceMole displays graphs of price positioning of your products, alongside your competitors over a selected period of time. Black Friday and the week leading up to it, will be a time filled with crazy off the chart price changes. Learn to read the chart, and out sell your competitors, by watching trends and popular sales regions and times. 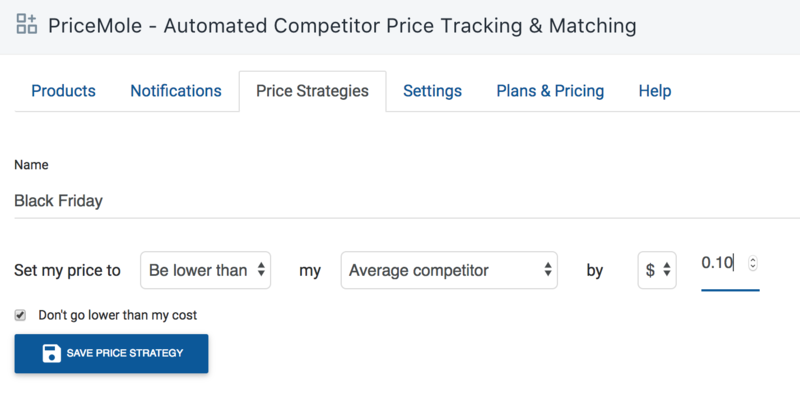 With automated competitor price tracking you can now determine which of your competitors influence your sales and price changes during a certain period of time, and how this affects the future of each product. Select a Product in your PriceMole app and you can enter into the pricing history to clarify the current market situation and your positioning towards competitors. - Black Friday. You know your competitor has no products left in stock, he sold out. It doesn’t make sense to keep a low price. The customer will choose your price because the product is available now. You win! - You run a dropshipping business. On Black Friday, suppliers will change their prices many times a day, and to manually keep track and not be undersold wastes hours of your time. You can automate your price to always sit a few dollars above your supplier, so you are never undersold again- win! You can know for sure when and which prices need to be changed by letting PriceMole automate competitor price tracking for you. Tracking and repricing can take anywhere from 20 minutes to 8 hours a day if you want to get it right. Don’t waste valuable time repricing, let the moles handle it. PriceMole turns pricing strategies and analytics into something automatic, saving time and achieving KPI’s. Retail price optimization and product planning are daily tasks for many business owners of all sizes and industries around the world. You can achieve everything listed above and optimise your own workflow towards rapid time saving performance. Black Friday is just around the corner, and all of it’s crazy sales, coupons, retailers, shoppers and stock are coming with it. Start monitoring the competitive landscape, and evaluating the way customers will feel about the pricing decisions you make this year. 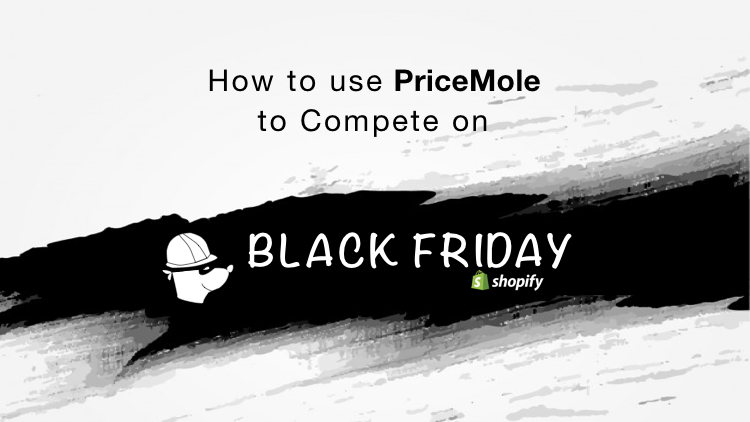 Join PriceMole today and automate your competitor price tracking and repricing!